Samburu National Reserve is a game reserve found in Northern Kenya, Samburu County. The reserve is named after the Samburu Community who are known for their remote culture, pastoralists and nomadic ways. Though the reserve is smaller than other Kenyan parks like Maasai Mara and Tsavo, it is rich in wildlife attributed to how it has retained its natural state due to the fact that the area was inaccessible for many years. The park area is categorized as an arid and semi-arid area with weather being hot and dry during the day and cold at night. Rainfall is experienced in the months of April-May and October-November, other months remain dry. We have River Ewaso Ngiro cutting through the reserve acting as the main source of water for the animals. The reserve is one of the two area which conservationist George and Joy Adamson raised Elsa the lioness made famous for the best-selling book and award-winning movie Born Free. This is also home of Kamunyak, the lioness famous for adopting oryx calves. The park is accessible through road, it is about 345km (approx 214 miles) from Nairobi and would take about 5 hours to get there through either Isiolo or Archer’s Post. There are also daily flights from Nairobi to Samburu that can be booked online. The flights land on the reserve’s airstrip. Private charters are also allowed to land on the airstrip. Game Viewing: There are many wildlife species in the park including the Northern rare species also known as The Special Five i.e The Reticulated Giraffe, Gerenuk, Bersia Oryx, Grevy Zebra and Somali Ostrich. There are also the three big cats; Lion, Cheetah and Leopard, A big population of elephants, cape buffaloes, hippos, wild dogs, olive baboon, grant gazelles, Kirk’s dik dik, impala and waterbucks. River Ewaso Ngiro also has a number of Nile crocodiles. BirdWatching: The reserve is known to have a huge number of bird species, over 350 species in record. This include; grey-headed kingfisher, sunbirds, bee-eaters, marabou stock, tawny eagle, bateleur, vulturine gunieafowl, lilac-breasted roller, northern red-billed hornbill, palm-nut vultures etc. Samburu Cultural Tours: The Samburu community is one tribe in Kenya that has retained it’s culture over the years. They are known as pastoralists and nomads who always move from one area to another in search of pasture for their livestock. They live in small villages and are always endorsed in beaded ornaments that can be bought off as souvenirs. Some of the best safari lodges in Kenya have also set camp is this area offering luxury stay in this side of the wilderness. Below are some best based on recent guest reviews. Elephant Bedroom camp is located along the Ewaso Ngiro River at the Samburu National Reserve. Accommodation is provided in luxury tents facing the river each having a sitting area and a plunge pool. The camp also has a spa and free WiFi in the public areas. Variety of meals are offered at the restaurant and room service can be arranged upon request. Other services such as airport shuttle and laundry services can be arrange at a charge. Guest can enjoy guided walking tour along the reserve, game drives and cultural tours. Situated at the banks of Ewaso Ngiro River, Samburu Intrepids offers fully furnished, thatch roof luxury tents all furnished with a wooden floor and mahogany furniture. The facility has an outdoor pool and restaurant that serves buffet-style meals and afternoon tea. There is a playground for the kids to keep busy while at the camp. Relaxing massage treatments can be arranged upon request. Guest can enjoy guided bush walks in the morning, game drives in the morning and evening as well as cultural visits. Ashnil Samburu is located at the Buffalo Spring Game Reserve. It’s features include an outdoor swimming pool with sun loungers, a garden and lounge bar offering great views of the Savannah. The restaurant at the camp offers a variety of meals such as oriental, traditional and international cuisines. A bush breakfast or picnic lunch is available upon request. Accommodation is in modern fitted tents with parquet floors and a seating area. Each tent has a decked terrace with a view of the Ewaso Nyiro river. Activities while at the camp include game drives, nature walks and cultural visits to the Samburu communities. A massage can also be arranged at a charge. Sentrim Samburu is situated at Archer’s Post, about 700m from Samburu National Reserve and 11km from Kalama Wildlife Conservancy. Lekurruki Conservation Trust is also 31 km from the lodge. There are 20 rooms with a family room available for accommodation and come with coffee making facilities and en suite bathroom. A full English/Irish breakfast is served every day. Guests can enjoy guided nature walks, game drives and cultural visits. Car rental services are also available. 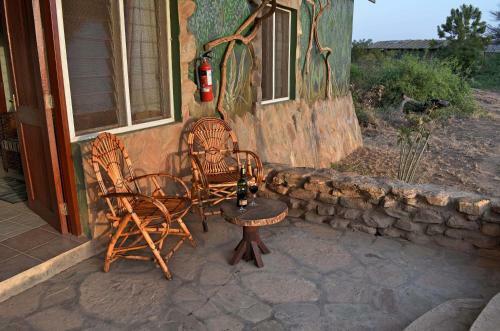 This is an eco-friendly camp with a garden offering pet friendly accommodation. The Samburu Riverside Camp is located 19km from Archer’s Post and 15km from Marti Lgirgir Plateau. Accommodation is in a tent with bed-linen, The camp has communal modern flush toilets and a permanent cooking area. However, barbecue meals are available as well as grocery delivery. It is advisable not to leave food in the tents as monkeys and bugs are known to invade the tents during the day when guests are out on excursions. 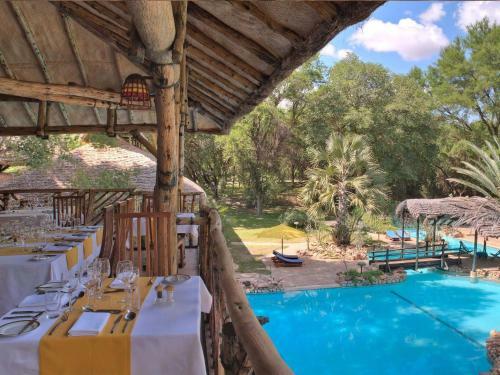 Perched in the banks of Ewaso Ngiro River, Sarova Shaba is located in the heart of Shaba Game Reserve. The facilities feature indigenous trees, a fishpond and a large swimming pool. The rooms has a great view and come with a safe, minibar and desk. The restaurant offers a variety of cuisines mostly served buffet-style and you can enjoy a variety of drinks at the bar. There is a shared lounge and a games room open to guests. The lodge has a fleet of safari vehicles and guides to offer game drives. I would love to go on a safari in Africa. It has to be nice to walk out in fair predictable weather. I expect it must be a dry heat. I have experienced so much humidity related heat in my life, I would like to experience a dry heat for once. I would love to see native African animals too. I have read about Elsa the lioness. It would be an interesting experience to roam where she did. The natives sound friendly. Hi Tidbury, you should consider taking the safari. It is not always dry heat, there are also rainy wet seasons though not highly recommended to take safari then. Generally you will love the weather, the people and the wildlife. I’m speechless after reading your article. The images are breathtaking and the Samburu National Reserve sounds like a fantastic safari adventure. I certainly want to experience a safari at least once in my life. I like the idea of trying something different than the popular national parks especially to ensure we can see wildlife in their natural, unspoiled landscape. Meeting the Nomad tribe is also a great plus and an experience I imagine to be exceptional. Also, I wonder if it’s possible to communicate with the people from the Samburu community through the tour guide? I would love to learn more about how they live as Nomads. The Elephant Lodge image you added is very inspiring with an impressive river in the background. I guess it’s possible to see many animals right from the balcony while they drink from the river. Even Nile crocodiles! Thanks so much for this dream tour article! Glad you found it interesting Carolyn. It is a great experience by the River watching animals. Most of the tour guides in this area are actually from the Samburu Tribe well experienced and will share all about their tribe and culture while touring their village.